Internet Archaeology is an independent, not-for-profit, peer-reviewed journal for archaeology. The journal is open access and operates only to sustain itself. IA publishes articles of a high academic standing while also exploring the potential of electronic publication. The journal was established in 1995 and has been publishing online since 1996. IA was a subscription journal between 2000-2014, but completed the transition to open access in September 2014 and was awarded the Directory of Open Access Journals Seal in recognition of our high standards in publishing best practice, preservation and openness in 2015. Internet Archaeology is hosted by the Department of Archaeology at the University of York and is produced, managed and edited by Judith Winters, who is supported by co-directors Prof. Julian Richards (York) and Dr Michael Heyworth (Council for British Archaeology). A team of advisory editors also support the journal. The contents of the journal are archived with the Archaeology Data Service whose remit is the long-term preservation of digital research materials. Archive policy: Internet Archaeology is archived by the Archaeology Data Service, the national digital archive for archaeology in the UK. Author information: View our author guidelines here including editorial policy. Code of Conduct: Internet Archaeology is not a member but adheres to OASPA's code of conduct. Copyright/Licencing policy: IA disseminates content under a Creative Commons Attribution licence (CC-BY) licence. Under this licence, authors do not assign their copyright to Internet Archaeology but instead retain ownership of the copyright for their content, and allow anyone to download, reuse, reprint, modify, distribute, and/or copy the content as long as the original authors and the source are cited with re-users making clear the licence terms under which the work was published. Data papers: view our guidelines on data papers. Data protection: Internet Archaeology does not retain any personal author data beyond name, email, ORCID and workplace affiliation. Donations: Support publishing and archiving costs of researchers who have no means of institutional support by donating to our Open Access Archaeology fund. All donors of £25 or more will receive one of our highly sought after USB trowels by way of thank you. Editorial policy (aims and scope): Internet Archaeology is broad in scope, accepting all manner of research and method articles, data papers, reviews through to e-monographs. IA aims to publish articles of a high academic standing using the strengths and potential of the digital medium. Fees: Authors (or in most cases, their research funding bodies, affiliated institutions and/or other supporters) pay an APC (article processing charge) which pays for the digital development and preservation of the article and all its elements. Authors should include a budget for article processing charges (APCs) where this is an allowable expense. Fees for articles will vary but the cost is based on a combination of article length and technical requirements, which of course vary significantly. See our editorial policy for an illustration). Fees are payable only after a successful referee stage. Discounts and waivers are available (see below). The decision to accept an article for publication in Internet Archaeology is not tied to availability of APC. Fee waivers: We are investigating alternative means to fund the publications of the significant numbers of unfunded archaeological researchers but in the meantime, Internet Archaeology can offer a discount or full waiver to authors in case of economic hardship or to those who do not have access to publication funds. Please indicate in your initial proposal or contact us should you need to discuss waiver options, which will be negotiated individually with the corresponding author. Monograph publication: Internet Archaeology is so much more than a journal. We will consider publishing any long-form publication, including monographs. 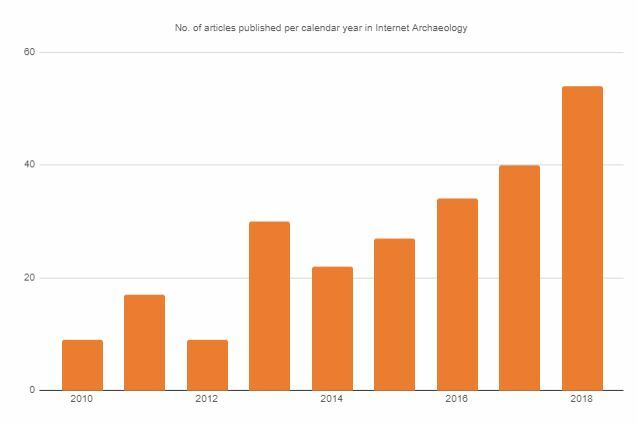 Open access policy: Internet Archaeology believes that open access to archaeological research offers significant academic, professional and social benefits. Providing free, immediate, online access is the most effective way of ensuring that research can be read, integrated and built upon. As an open access journal, Internet Archaeology creates more value than it did as a closed version. Internet Archaeology has been awarded the Directory of Open Access Journals Seal in recognition of our high standards in publishing best practice, preservation and openness. Open Badges: Internet Archaeology supports open practices and recognizes the value of researchers sharing their research results in ways that allow others to reproduce their findings and reuse their methods and data. Open Badges are awarded in in recognition of authors' open scientific practices. Peer review: Internet Archaeology usually operates double-blind peer review following initial screening (at the proposal stage) but we are open to experimentation e.g. open peer review. We also use anti-plagiarism software to ensure academic integrity. REF: All Internet Archaeology is eligible for submission in the next UK Research Excellence Framework. Authors are advised to use the 'gold OA' exception in the policy which means they do not have to deposit their work separately in a repository. Self-archiving policy: Internet Archaeology is a RoMEO Green publisher. Sponsorship: Internet Archaeology accepts sponsorship from commercial, not-for-profit and academic institutions as long as the service being promoted is of archaeological relevance and will be of interest to our readership.